The Census Bureau reported that private residential construction spending activity increased 1.8 percent during January. The preliminary estimate for December was boosted higher to show a 1.5 percent gain, versus the originally reported increase of 0.8 percent. After falling in July 2010 to its lowest reading since mid-1995, spending on private residential construction projects has increased in each of the last six months — rising to its highest dollar value since January 2010. Spending on new single-family home construction climbed 2.5 percent versus December 2011. In addition, the level of spending activity has increased in each of the last eight months and on a year-over-year basis this category has registered a gain of 5.5 percent. Although this improvement is modest, the sustained period of growth corroborates the mounting evidence from indicators such as the Wells Fargo/NAHB HMI, new construction starts and home sales that the housing market might have found that elusive recovery. The recent quickening in the pace of new job growth and still-high levels of housing affordability should only bode well for additional growth in single-family construction activity over the near term; however, tight mortgage lending standards and competition from distressed property sales will remain a limiting factor going forward. 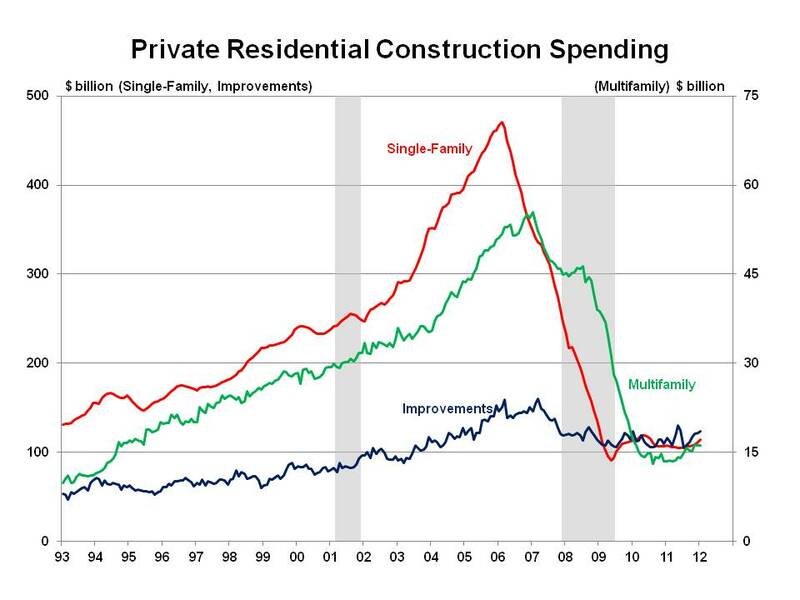 Multifamily construction spending ticked higher by 0.7 percent in January. While month-to-month fluctuations for this category have been more volatile, the level of spending has certainly trended higher during the past year with a 20 percent increase versus January 2011. Authorized multifamily (5+ units) building permits remained above 200,000 annualized units for the third consecutive month in January 2012, pointing to likely gains in spending over the near term. The home improvement component of construction spending increased for the sixth consecutive month during January, gaining 1.3 percent on a month-to-month basis. Overall, remodeling did not endure the same degree of decline in activity when compared to new construction for single-family and multifamily projects. In fact, during 15 of the last 16 months, the level of home improvement spending has exceeded that of new single-family homes. A combination of tax credits for retrofitting homes with energy efficiency equipment and rehabilitation/repair work on distressed properties has likely bolstered demand for home improvement spending.